Located on the estuary of Yangtze River, Chongming Island is the third largest island in China. Being the largest alluvial island at the estuary of a river and the largest sand island in the world, Chongming Island is also acclaimed as “Door to the Yangtze River, Yingzhou Island (a celestial mountain in fairy tales of ancient China) in the East China Sea”. Chongming Island has been in existence for more than 1,300 years. Now, it covers an area of 1,267 square kilometers (489 square miles), with a population of 635,000. The whole island is flat in terms of terrain, with fertile soil, luxuriant forests and abundant resources. As a result, Chongming Island has become a famous region where the cultivation of rice and the breeding of fish flourish. East of Chongming Island is the East China Sea, while in the south, Chongming Island faces Pudong new area, Baoshan District in Shanghai and Taicang City in Jiangsu Province across the river. Separated by water, Haimen City and Qidong City of Jiangsu Province are to the north of Chongming Island. Beside Chongming Island, there are another two islands in the Yangtze Estuary: Hengsha Island and Changxing Island. The formation of Chongming Island is closely connected with the evolution of the estuary of Yangtze River. It is only a one-hour drive from the center of Shanghai to Chongming Island thanks to the Shanghai Yangtze River Tunnel. Tourists can go to Shanghai Science &Technology Museum, North Zhongshan Road first. Ships from Gonghexin Road Wharf, Baoyang Road Wharf, Wusong Wharf and Shidongkou Wharf all go to Nanmen Port of Chongming Island. Chongming Academy is one of the only existing academies in Shanghai. Chongming Academy today is also known as Chongming Museum. It is a city-level heritage conservation unit. At the entrance there are two decorated archways consisting of two stone pillars, simple and solemn. There are eight characters on them, saying “De Pei Tian Di, Dao Guan Gu Jin” (德配天地道贯古今, meaning &apos;morality for heaven and earth; doctrines for the past and now&apos;). In front of the gate, there are two maidenhair trees, both with a history of 350 years. They are so thick that three people have to get each other’s arms around to round the tree. Two big stone lions are guarding at the gate, dignified. The largest building in Chongming Academy is Dacheng Dian (大成殿 ‘Hall of Great Achievement’). Its role is like the Daxiaongbao Dian (大雄宝殿 ‘the Great Buddha’s Hall’) in the temples. This is where Confucius‘ statue is enshrined. Dong Wu (&apos; The East Rooms&apos; at the sides of or facing the principal rooms) and West Wu (&apos;The West Rooms&apos;) were the dormitories of the 72 outstanding disciples. Today &apos;Hall of Great Achievement&apos; is temporarily used as the exhibition room of ancient ships. Dong Wu is the exhibition room for photos and stories of some celebrities in Chongming, and some ancient wares unearthed in Chongming. 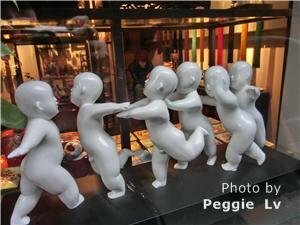 And the West Rooms holds the Huang Pimo art gallery. There are three parts of the exhibition in the museum, including “The Formation and Development of Chongming Island”, “Historic and Cultural Relics”, and “Natural History”. 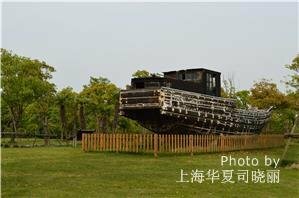 These three parts introduce the long history and rich cultural heritage of Chongming Island systematically. Another two buildings behind Da Cheng Dian (Hall of Great Achievement) are exhibition halls of folk-customs in Chongming. Besides, there are architectures like palace walls measuring around 25 km or 16 miles (ten thousand ren an ancient measure of length equal to seven or eight chi, about 2.33 meters to 2.67 meters) including Lingxing Gate, Dengyun Bridge, Jimen Gate, Minghuan Temple, Chongsheng Temple, and Zunjing Pavilion. These are all well-preserved architectures of the Ming Dynasty (1368–1644). In front of their gate, there are five 18-meter tall maidenhair trees, all having a history of 377 years. They are in harmony with the 2 uniquely-designed wooden and stone memorial arches, making a strong sense of ancient elegance. Bus then ferry: Take the Tourism Line 5, 51, 116, 522, 728, 848, 849, or the Port Line to Wusong Port; or the Tourism Line 5, 51, 207, 508, 541, 728, the Pengjiang Line, or the Port Line to Baoyang Road Port. Then take a ferry to Nanmen Port of Chongming Island. Exiting Nanmen Port of Chongming Island, continue walking 200 to 300 meters, and people will see layers of ancient architectural complex. This is Chongming Academy. Dongping National Forest Park is the largest man-made forest on the plains of Eastern China. It is also the largest forest park in Shanghai. It is a national 4A-level tourist attraction and agricultural site . Dongping National Forest Park grew out of Dongping Tree Farm, which came into being in 1959. After 30 year’s development, Dongping National Forest Park&apos;s trees grow luxuriantly, full of the charms of nature. The main facilities in Dongping National Forest Park are the crab-shaped multi-function meeting center, Forest Bar, Forest Rehabilitation Center, Forest Beach Bathing Place, Water Park, Beach Volleyball Ground, Camp Base for Teenagers, Horse Race Field, forest hammocks, facilities for barbecues and picnics, gardens and orchards, forest villas, the Forest Maze, windmills, and other facilities for activities like forest sunbathing, hunting, paintballing, forest grass skating, rock climbing, and so on. Location: Dongping National Forest Park is in north central Chongming Island, 12 kilometers (7 miles) from Nanmen Port (county town). Take the Shenchong Line at North District Bus Station or the Nandong or Nanjiang Line at Chongming South Gate Bus Station direct to Dongping National Forest Park. Alternatively, from Nanmen Port take the bus to Dongping National Forest Park. Taking a taxi takes about 20 minutes. Entry: 40 RMB. Children under 1.4 meters tall can buy half-price ticket. By showing their credentials, elderly people aged above 70 can go into the park for free. Teams having more than 20 people can enjoy a twenty percent discount. Dong Tan Migratory Bird Protection Area is a wildlife resources base at the estuary of the Yangtze River. 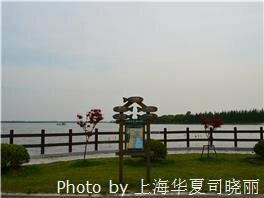 On August 9th, 2005, Dong Tan Bird Habitat of Chongming Island was listed as a national nature reserve by the State Council. Dong Tan Migratory Bird Protection Area covers an area of 300 square kilometers. It is one of the few habitats of certain wild birds in the world. It has been declared one of the world’s important wetlands. In Dong Tan there are 116 kinds of birds. The number of little swans that live in Dong Tan through the winter reaches 3,000 to 3,500. There are other more rare birds like the greater white-fronted goose, striated heron, and the black-faced spoonbill. Apart from theses, the number of the migratory birds resting in Dong Tan on their way of migration is up to 3 million. While appreciating the birds, people can see large groups of birds flying over the sky, like huge clouds. The best time to appreciate birds in Dong Tan is in the morning, because the sunrise over the East China Sea is another beautiful natural sight of Chongming Island. Dong Tan is the most easterly land on Chongming Island facing the East China Sea. After viewing the birds go to Chenjia Town, find a clean local restaurant and order a plate of steamed crab and some other seafood. The largest crab market on Chongming Island is in Chenjia Town; it is also the largest crab market in China. Most crabs in the markets of Shanghai come from Chenjia Town. There are more rare seafoods in Chenjia Town than in other places, with lower prices. Take Tourism Line 5 to Baoyang Port. Then go to Baozhen Town by ferry, and finally by road to Dong Tan though Lin Baoqian. Ferries from Wusong Port also go to Dong Tan, but there are only four ships going there every day. Boats from Wusong Port to Baozhen Town charge 14 RMB per person. A motorboat from Baoyang Port to Baozhen Town is 30 RMB per person. Location: Dong Tan Migratory Bird Protection Area is in the east of Chongming Island. It begins from Tuanjie Sandbank and Water Gate in the south, and stretches to North Baxiao Port in the north. In the west, its boundary is the causeway which was built in 1968, and in the east it reaches 3,000 meters out to sea. Self-driving route: central city of Chongming – Yixian Elevated Road – Tongji Road (Road A30) – Baoyang Road – Baoyang Road Port – Chekedu – Baozhen Town – South Baozhen Road – North Baozhen Road – Chenhai Road – Beichen Road – Baichen Road. Jin&apos;ao Mountain (金鳌山) is next to Shou&apos;an Temple which is one of the four ancient temples on Chongming Island. The landscaping of Jin&apos;ao Mountain exhibits the charms of South-China-style gardens. Though the original eight famous sights of Jin&apos;ao Mountain no longer exist, sights like Qingyuan Hall, Guanyin Pavilion, Hanmo Forest, Zuihua Water Pavilion, Jiashan Pavilion, Black Bamboo Grove, Deyue Bridge, Shuixiang Water Pavilion, and Yue Garden are all exquisite, with clear water, twiggy woods, and winding paths. "There are green hills out of the green hills that circle the temple, and pavilions in the clear waters that are in the pavilion”. Apart from the grand main hall, Daxiaongbao Dian (大雄宝殿 ‘the Great Buddha’s Hall’), Sansheng Dian (三圣殿 Three Saints Hall) and Tianwang Dian (天王殿 ‘Hall of the Celestial Kings’) have their unique charms as well. There are 16 statues of Buddha including a statue of Sakyamuni made of camphor wood, colored gold sculptures of different gods; statues of the future Tathagata, present Tathagata, and past Tathagata; a statue of Manjushri, a statue of Samantabhadra, and a statue of Avalokitesvara. Among them, a huge jade statue of a reclining Buddha is the largest jade reclining Buddha in Shanghai. It weighs 13 tons, measuring 6 meters in length. Further along the west wall of Shou&apos;an Temple, people will reach the most famous scenic spot on Jin&apos;ao Mountain: Zhenhai Tower (&apos;Tower to Calm the Sea&apos;). It is said that the previous Zhenhai Tower was built in the 19th year of Guangxu in the Qing Dynasty (1893). The money used in the construction came from the rich families in the local town. Zhenhai Tower is on the high peak of Jin&apos;ao Mountain, first built in the seventh year of Kangxi in the Qing Dynasty (1668). 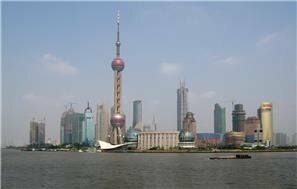 Zhen Hai Tower (Tower to Calm the Sea) was rebuilt in the year 1986, a nine-story tower with wooden stairs. On each story, 6 small statues of Bodhisattva are enshrined. The rooms get smaller with each floor up. The top room is so small that it can only hold one person. Standing at the top of the tower, looking far into the distance, people will have a panoramic view of Chongming Island and the East China Sea. On clear days, people can even see the sea beaches. There once was a Guanyin Pavilion (Pavilion of Avalokitesvara). Later it changed its name to Cangha Pavilion (the Sea Pavilion). During the reign of Emperor Qianlong in Qing Dynasty, this pavilion was one of the eight famous sights of Jin&apos;ao Mountain. At that time it was called “Aofeng Yuan Tiao” (meaning looking from Ao Peak). Location: Jin&apos;ao Mountain is located in Aoshan Village, Houjia Town, Qiaozhen District of Chongming Island. Take Tourism Line 5 to Jin&apos;ao Mountain. To include more out-of-the-way attractions like those on Chongming Island in a Shanghai tour, you will need a flexible China-based travel agent like China Highlights, that is willing to go the extra mile. 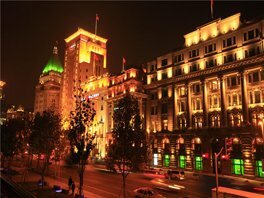 Contact us to discover Shanghai your way.